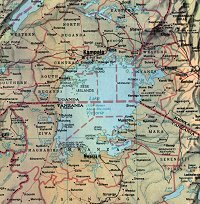 Lake Victoria is the second largest freshwater lake in the world. It covers nearly 27,000 square miles, an area roughly the same size as the Central American country of Costa Rica. Bordered by Kenya, Tanzania, and Uganda, the lake serves as a valuable resource to the region providing food, potable water, hydroelectric power, and transportation. Water hyacinth (Eichhornia Crassipes) is a free floating water plant that is native to South America. It can vary in size from a few inches tall to over three feet. This plant has blue-green leaves, thick stalks and a showy purple or lavender flower. It thrives in tropical regions and in waters that are high in nutrients. The main way water hyacinth reproduces is for a mother plant to send out a stalk which grows a daughter plant, which matures and sends out another daughter plant, and so on. It is common to find several generations among one stand of hyacinths, as the plants often remain entangled in a large mass. Hyacinths can also reproduce through seed, but the seeds must germinate in very shallow, muddy areas. A seed dropped in relatively deep water is unlikely to ever grow. Rarer still is the possibility of the hyacinth to regenerate from a plant fragment. It may be able to do so, but it would take ideal conditions and several months for a whole plant to form. Aquatic plant line drawing is the copyright property of the University of Florida Center for Aquatic Plants (Gainesville). Used with Permission. Although no one is sure exactly when the water hyacinth first entered the lake, it most certainly traveled down the Kagera River which empties into Lake Victoria. Satellite photos taken of Lake Victoria in 1996 showed that hyacinths covered nearly one percent of the immense lake. This figure is now estimated as high as three percent. The Kenyan coastline and Port of Kisumu have been particularly hard hit by this menacing weed. Huge mats have paralyzed the area, at times preventing even large boats from leaving the harbor.